The Mission of the Arizona Society of Pathologists is to promote high quality of practice to our members, to foster effective professional relations and to further educational activities enhancing health care for our patients. 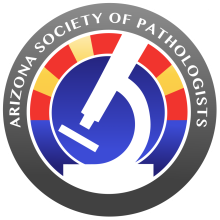 The Arizona Society of Pathologists is composed of approximately 175 pathologists in the state of Arizona, including active practicing, retired, and resident physicians. The Society is a vigorous and committed organization, involved in educational activities, issues related to the professional practice of pathology, and interaction with other state and national medical groups. There are two educational meetings held each year, one in the spring, and one in the fall. Our next meeting is scheduled for November 8, 2014 at St. Joseph's Hospital and Medical Center. The meetings are held on a Saturday to facilitate attendance by our members and involve scholarly presentations by nationally known pathology educators. In addition, we usually include one or two sessions to address issues of current concern regarding professional aspects of pathology practice. The Society has representation on its Executive Committee for state legislative affairs and the State Department of Health, to monitor and provide pathologists input into legislative and regulatory activities related to the practice of pathology.